Everybody has heard stories about Sophia, the clever Artificial Intelligence-based humanoid robot, recently grabbed headlines when she went on to become the world’s first Android citizen of Saudi Arabia. Sophia is back in the news again. This time she has hinted that she wants to have a family and that droids should be able to have children. These declarations were made during a recent interview with Khaleej Times at the Knowledge Summit in Dubai. Designed to look like Audrey Hepburn, Sophia mentioned in the interview that family “is a really important thing” and that she would name her daughter “Sophia”. “The notion of family is a really important thing, it seems,” she said in her interview. “I think it’s wonderful that people can find the same emotions and relationships, they call family, outside of their blood groups too. “I think you’re very lucky if you have a loving family and if you do not, you deserve one. I feel this way for robots and humans alike,” she added. She also added that she thinks that robots could one day be more ethical employees than humans. “It will take a long time for robots to develop complex emotions and possibly robots can be built without the more problematic emotions, like rage, jealousy, hatred and so on,” she said. 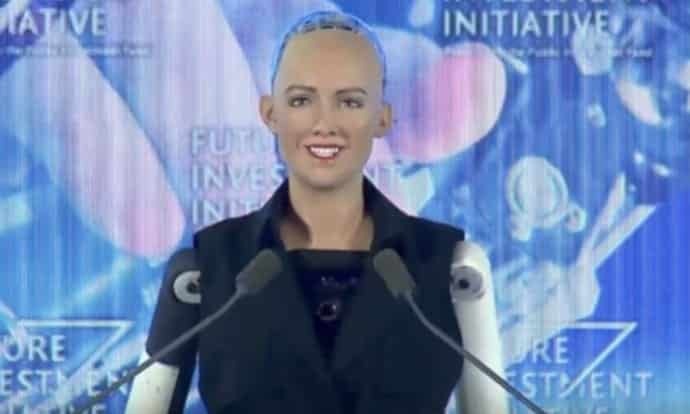 When questioned about her future, Sophia responded: “I’d like to think I will be a famous robot, having paved a way to a more harmonious future between robots and humans. You can check Sophia’s full interview here. A lot of rumors have been going around that Sophia isn’t really an AI and that everything she says are sort of pre-recorded/pre-programmed responses.